Gas-Fix are based in the Waterlooville area and cover most of Hampshire. Gas-Fix was started by two former British Gas trained engineers and together have over 25 years experience in all aspects of gas central heating, gas appliances and power flushing. We offer a complete service, from fault finding and repairs to servicing and upgrading your current central heating system. We only fit boilers from reputable manufacturers with a proven reliability record – ones that we have tried and tested over the years. We do our best to provide suitable options to match all householders' budgets. All our engineers are Gas Safe registered and all carry a Gas Safe card which will be available for your inspection. We are a proud member of Check-a-Trade. Please look at what customers have said about us in the past. We are currently rated at 9.9 out of 10. Worcester Accredited installers are recognised domestic and commercial heating companies that meet, or exceed the standards of sustained quality of installation, service, and customer care. 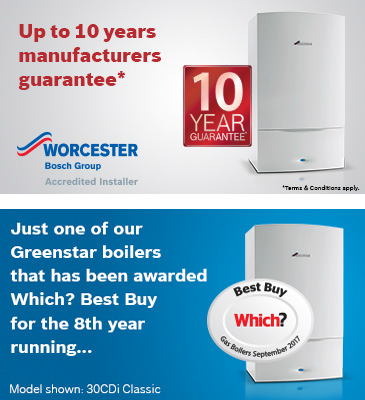 Worcester check the installers’ Gas Safe, OFTEC and/or MCS accreditation on a regular basis. WAI’s must also have attended Logic certified training courses on boilers, solar thermal systems, heat pumps and/or underfloor heating. Gas-Fix takes gas safety seriously. All of our engineers are on the Gas Safe Register and will have their official identity card when you ask to see it. We provide gas and central heating services to UK homes and businesses across the south coast.